Continuous Professional Development (CPD) means career-long learning and training, in order to advance each individual Marine Pilot’s knowledge, skills and professional behaviour. This is to ensure that related port and shipping industries are provided with marine pilotage services that are of the highest standard. A measure of this is achieved through recognition of points in professional evaluation, ongoing skills and knowledge development, and ongoing training in emergency pilotage. To undertake Continual Professional Development (CPD) is part of our responsibility as Marine Pilots. CPD is now widely recognised as an integral activity of any well-run, conscientious organisation or profession. The greater a profession’s public, environmental and commercial risk (real or perceived) the greater the public expectation is for that profession to maintain the highest possible professional standards. Marine Pilots operate in such a high-risk environment and it is, therefore, an imperative that Pilots undergo rigorous and relevant CPD. A Marine Pilot CPD system is required to maintain currency and advance an individual Pilot’s knowledge and skills to the highest standards. This is achieved through ongoing skills evaluation, undertaking educational activities, attending professional conferences and undertaking emergency response training. The CPD program also accounts for Pilots operating within a systematic safety culture. AMPI envisages Continuous Professional Development as a career-long learning activity for all Marine Pilots. The purpose of AMPI CPD program is to help individual pilots to measure their CPD against minimum standards. This will advance each individual Pilot’s knowledge, skills and professionalism. Also, this will help to ensure that any Pilot holding a Certificate of CPD Attainment will be a Pilot who meets the accepted professional standards. AMPI’s CPD program will demonstrate to ship owners and operators; port owners, operators and related users; local and national authorities; and the wider community that a Pilot has taken part in ongoing training programs that are recognised by their peak professional body. A Pilot who meets the minimum criteria for CPD, and is a financial member of the AMPI CPD program, will be issued with Certificate of CPD Attainment. Most of the CPD requirements have an expiry date and the AMPI issued certificate will have an expiry date based the earliest of these dates. AMPI aims to have their CPD requirements assist Licensing Authorities, Ports and Pilotage Organisations to set their own minimum standards for renewal of a Pilot’s licence. This can be achieved by including the AMPI CPD requirements within local regulations, guidelines or within a Safety Management System. 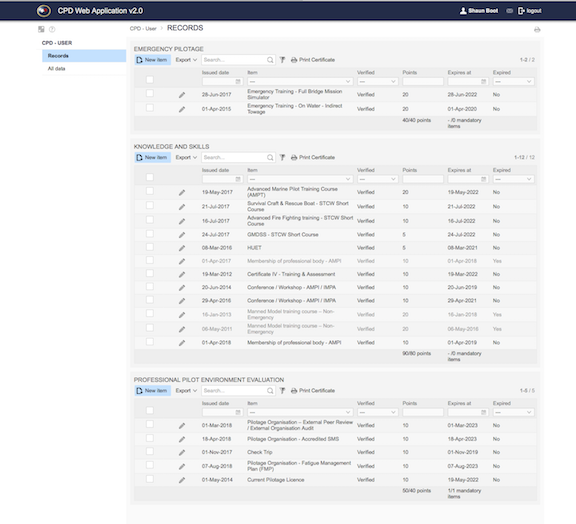 It is not intended for use as a Pilot selection tool. It is not intended as a Pilot’s initial training program. It does not replace the standard regulatory entry qualifications for new pilots. It is not a record of a pilot’s professional performance. Vessel’s who engage the services of an AMPI certified pilot can be confident that the pilot that they have engaged has maintained the skills and the current knowledge deemed necessary by their peers to enable them to perform their duties to the highest possible standard. 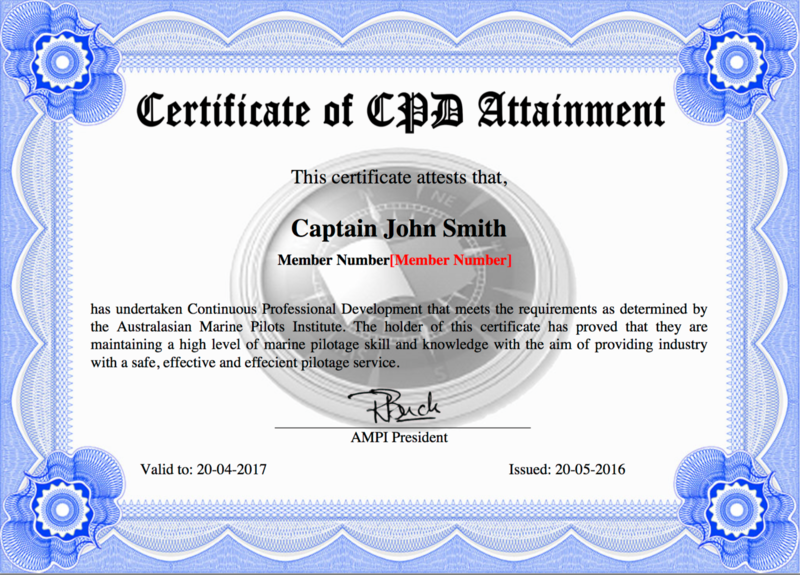 Having pilots with current CPD certification helps pilotage organisations meet aspects of their due diligence requirements. It takes the burden of setting CPD standards off the local employer / regulator who often are not qualified to set such standards. The CPD program is web based and can be accessed through the AMPI website. The Certificate of CPD Attainment’s expiry is based on the soonest item expiry date. For example, if the earliest expiry date of an item is in 3 years time then the CPD certificate will expire then. This ensure that the process is driven to remain continuous. To attain a CPD Certificate of Attainment, the combination of minimum points in each area , generated by non-expired items will result in issue of the Certificate. Additionally, it is possible to designate particular items as Mandatory so that these must also be achieved before a CPD Certificate can be generated. In this way, regulators can ensure that local or regional minimum training requirements are met.